The role of affect in how people think and behave in social situations has been a source of fascination to laymen and philosophers since time immemorial. Surprisingly, most of what we know about the role of feelings in social thinking and behavior has been discovered only during the last two decades. 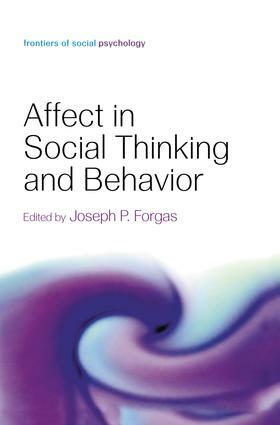 Affect in Social Thinking and Behavior reviews and integrates the most recent research and theories on this exciting topic, and features original contributions reviewing key areas of affect research from leading researchers active in the area. The book covers fundamental issues, such as the nature and relationship between affect and cognition, as well as chapters that deal with the cognitive antecedents of emotion, and the consequences of affect for social cognition and behavior. This volume offers a highly integrated and comprehensive coverage of this field, and is suitable as a core textbook in advanced courses dealing with the role of affect in social cognition and behavior.